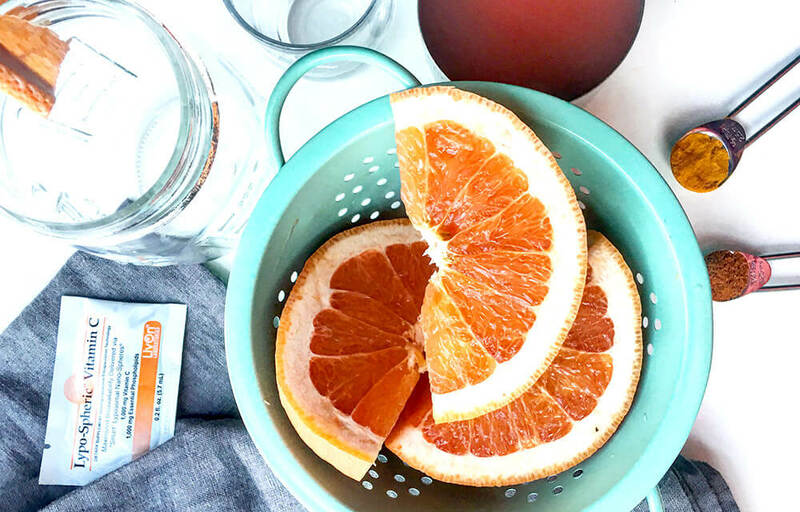 Lypo-Spheric™ Vitamin C + grapefruit, turmeric, and cayenne is like aloe vera at the cellular level. If you’re living it up this summer, you’re spending time in the sun. As you should. It’s great for mood and it’s just an essential of getting out and enjoying life. Like all good things, it comes with a punishment when enjoyed in excess. Photoaging is the cumulative effects of the damage of UV radiation from sunlight. It ages the skin prematurely. For all you beach bums, there’s some sun-sational news! Scientific studies have found numerous substances are helpful in offsetting some of the damage caused by sunlight. 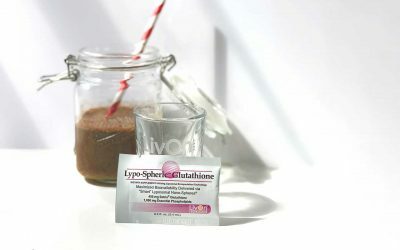 And we’ve combined a few of them into a tasty shooter that makes the key ingredient, Lypo-Spheric™ Vitamin C, a bit more delectable. Start with a base of fresh-squeezed grapefruit juice. 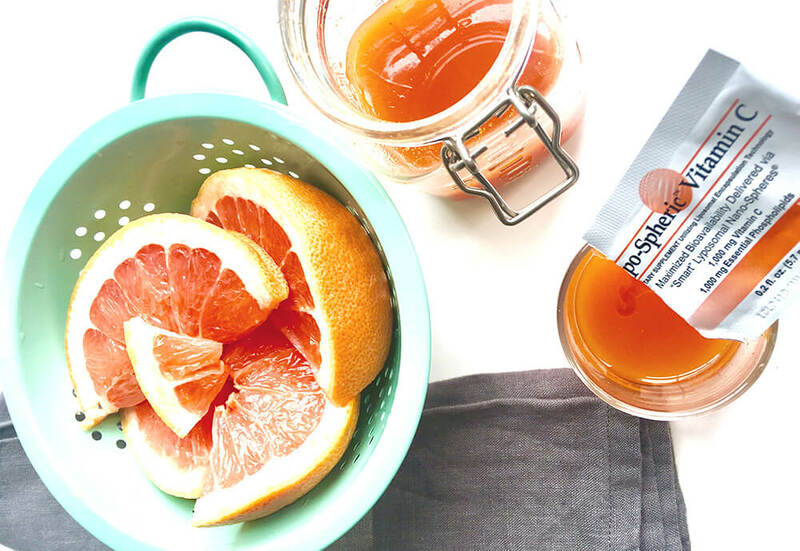 In a 2014 study, researchers found that grapefruit extract “is able to improve cell viability and to decrease UVB-induced ROS (reactive oxygen species a.k.a. free radical) levels.” Just make sure you’re squeezing the citrus yourself or buying fresh pressed grapefruit juice with no sugar added. Extra sugar can interfere with your body’s ability to absorb Vitamin C.
Then you’ve got turmeric, the heralded miracle spice. Its key component is curcumin, which researchers have found to bequeath a bevy of health benefits. The one we’re talking about here is its inhibitory effect on photo aging due to UV light. 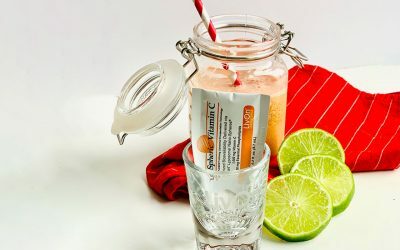 In a study on mice, researchers found that oral encapsulated curcumin was effective in preventing the formation of lesions after exposure to UV light. 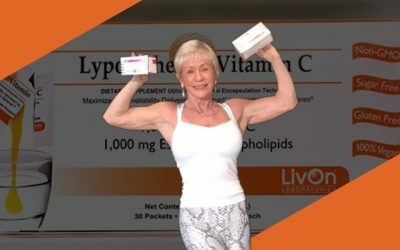 Then just squeeze in a packet of Lypo-Spheric™ Vitamin C for 1000 mg of a potent antioxidant that neutralizes the free radicals that build up in the skin from exposure to the sun, and you have your Summer Skin anti-photoaging shooter! The recipe below makes a week’s worth of 1 oz. shots, so we recommend storing in a mason jar in the fridge. 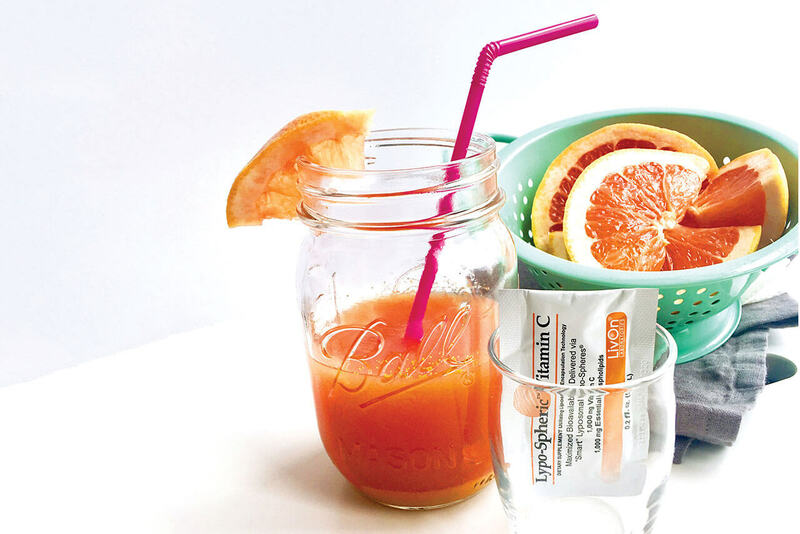 Or, if you want more of all the other ingredients, you can take your Vitamin C shot and sip the rest. It’s certainly got a kick. Combine grapefruit juice, turmeric, and cayenne pepper in a cup that enables pouring into a shot glass without spilling. 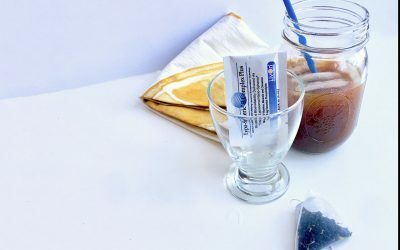 Pour an ounce of the juice into your LivOn Labs shot glass. 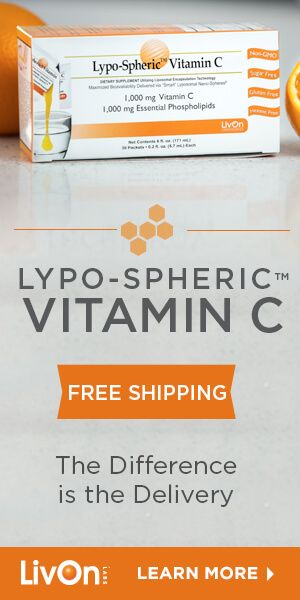 Squeeze a packet of Lypo-Spheric™ Vitamin C into the shot glass. Epilogue: Pour the remainder into a mason jar and refrigerate to use for the rest of the week. Or, stick a straw in it and sip away.